Something is happening at the Metro: Last Light website. Metro 2033 may not have been a huge hit but it was a fantastic shooter [although I admit to a certain bias in these matters] and fortunately showed enough potential to earn a sequel, revealed last year as Metro: Last Light. Troubles at THQ made the future of the game look possibly dubious, but it appears to be alive and well and ready to strut some stuff for us later this month. There's not a whole lot to see right now, but enterthemetro.com is now sporting a new logo and a countdown with a little under ten days on the clock. And what happens when it ticks down to zero? It's actually not much of a mystery this time, as the site states that a "live action short film" will premiere on the site on May 24. In Metro 2033, a world-ending event forced humanity to seek refuge underground in places like the Moscow Metro, where survivors eke out a desperate existence, searching for ways to save humanity while continuing age-old fights between political factions like Communists and Nazis. It's a dark, difficult, unforgiving and all-around unpleasant game, which is of course what makes it so awesome. We can only hope for more of the same in Metro: Last Light. Metro 2033 was based on the novel of the same name by Russian author Dmity Glukhovsky, who has also apparently been working with 4A Games on the development of the new game. However, Metro: Last Light will not follow the events of Glukhovsky's sequel, Metro 2034. 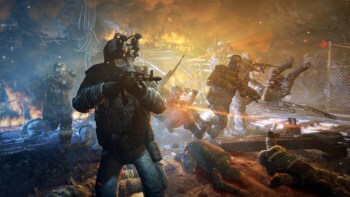 Metro: Last Light is currently expected to be out in early 2013 for the Xbox 360, PlayStation 3 and PC.